There have been times when I need a break from my monotonous schedule, but don't feel like travelling out of Delhi. Something similar happened a couple of weeks back and that's when I found solace in this beautiful property, Sandal Suites by Lemon Tree, Noida! After watching my IG stories a lot of you asked me that why did I choose this property for the staycation assuming it to be just another mainstream hotel but I am sure those dreamy social media pictures put rest to your assumptions and with this blog post, I'll be a lot more detailed about my stay experience at Sandal Suites, Noida. As HMxMoschino collection launches worldwide today, I decided to pen down my views about the same and also share a glimpse of the fun we had that night. So I got a chance to attend the pre-launch VIP shopping premiere of the Moschino's collaboration with H&M a couple of days back at One Style Mile, Delhi. While half of the collection was already sold out by the time I reached and I expect the same today at the stores, I managed to pick an oversized tee with embroidered logo, perfect for lounging and street style looks. I have already styled it in 10 different ways mentally. 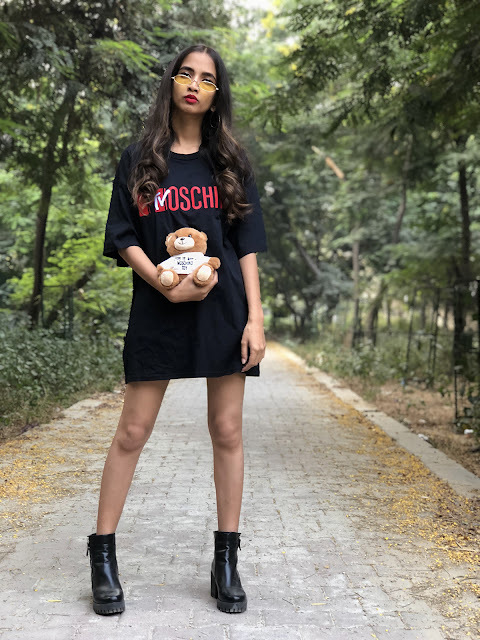 If you can't afford a Moschino then I would definitely suggest you to shop this collab as you'll get to experience the true essence of Moschino as pocket-friendly prices. The collection exhibits a very 90s exciting & fierce vibe. We put in a lot of thought and effort behind every outfit for any occasion. Every year on Diwali for me, it has been about going modern traditional with my look. But this year I decided to stick with the mainstream desi style and opted for a saree as my outfit, maybe because I have been shopping a lot of sarees these days (err.. wedding approaching). I am sure with so many Diwali outfits inspiration available on the internet right now one ought to get confused as to what to finally wear. So to keep it simple for you I picked a vivid saree from Unnati Silks. 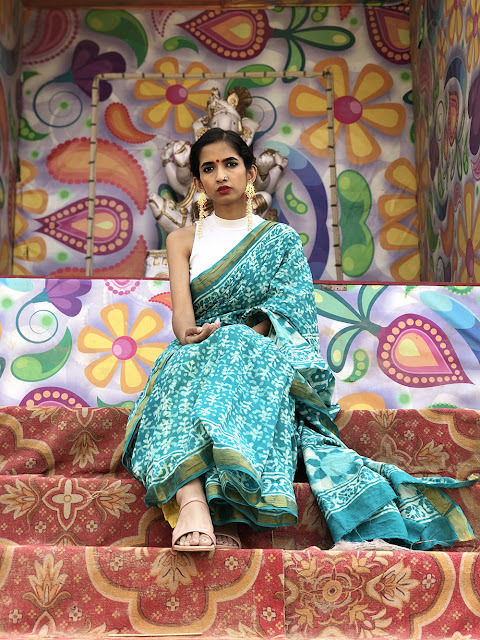 Unlike the traditional festive colours, I chose a turquoise Dabu print Rajasthani cotton saree and paired it with a white turtleneck blouse. I am someone who experiments a lot with drapes but since the idea was to keep it easy for the first time, I decided to opt for an open pallu (veil). Went a bit bold with my makeup & used my turquoise eyeliner & literally colour blocked it with a pop of matte red on my lips. Finally got back to attending the Fashion Week after a hiatus of almost a year. A lot changed since then, with Lotus Make-up being the main sponsor this season the hashtag became #LMIFW SS19! But what did not change was our enthusiasm to dress our fashionably best & observe the leading fashion designers displaying their best on the ramp. I decided to attend just the first day of the week this season because the line up included few my favourite designers like Péro, Huemn, Rimzim Dadu, to name a few. LMIFW SS19 was opened with Péro by designer Aneeth Arora, with the collection name 'Finding Péro', at an offsite location, The Park, New Delhi. It was inspired by the marine landscape with magnificently detailed headgears; the flowy outfits in soft hues with a dash of frills, ruffles and beaded fringed ends made it a show worth watching while sitting under the harsh sun. Also, the live music band made me want to groove along with the models, but alas.. we cannot do that! When I posted a picture off my Ajio box, quite a few of you (yes, I am not one of those who get alottt of DMs) messaged me about being interested to know what's inside. That's when I decided, how about a mini-haul post! Sale season at Ajio is something that I always look forward to, not just for the unbelievable slash in prices but mainly for the kind of absolutely stunning fusion garments that they offer during this period. Being someone who swears by fusion looks it's a win-win situation for me. Moving forward from the 'blacks', this haul was all about adding beautiful colors to my wardrobe. 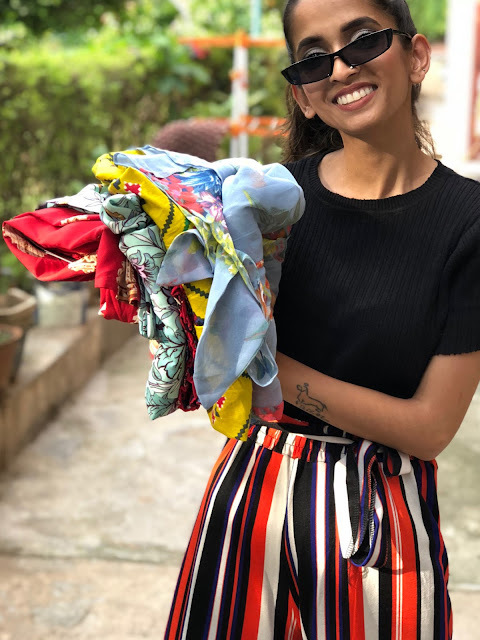 I managed to pick six garments for a total of INR 3067. Definitely a steal for me! Loved the combination of tropical print over an aqua base. The drop shoulder details & side slits (which can be buttoned up as well) made it a perfect pick for the summer season.